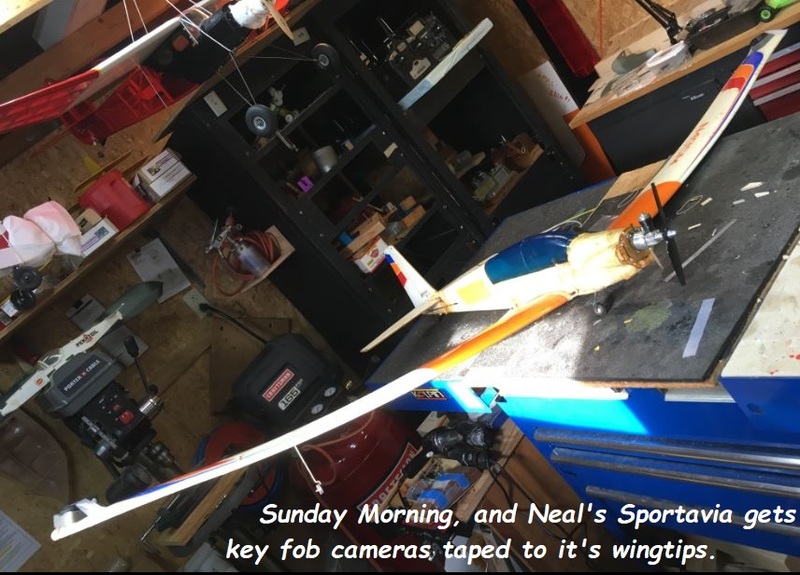 "Getting Neal's Sportavia Ready to Fly"
I've made a lot of good friends over the years of my involvement with these little toy airplanes, and one of the greatest was my flying bud Neal Needham. 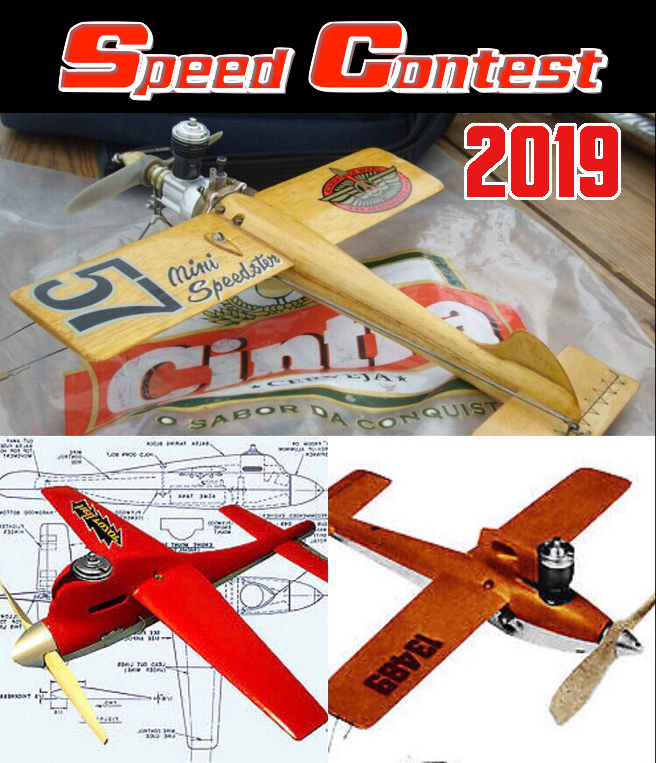 We had a very similar mindset as, far as model airplanes, holding a fondness for both heavy, fast speedsters and light, slow floaters. A favorite we shared was the powered sailplane, "Sportavia", marketed by Cox in the 1980's. Easily one of the most beautiful planes Cox ever sold, it is an elegant foam model, and could be powered by a version of the famous Cox Babe Bee .049 engine, or an electric motor. 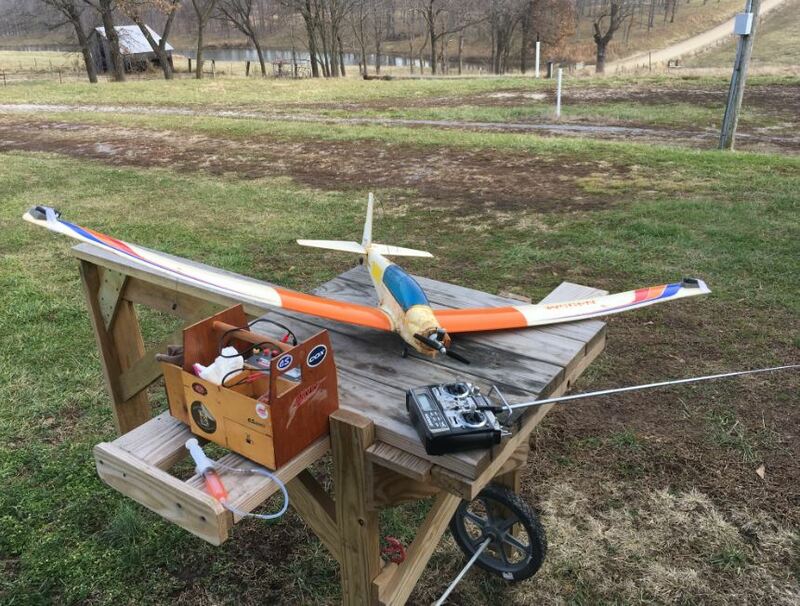 Ours were all fuel-powered and flown hard, being "go-to" regulars at Sunday flying sessions, and often flown from ball fields and parking lots. I literally wore out my first Sportavia...the foam of it's fuselage eventually getting soaked with fuel and oil from it's engine. My second lasted a lot longer, thanks to some thin coats of fuel-resistant epoxy, applied around it's snout. The plane in the photos belonged to Neal. He passed away almost 5 years ago, and his son, Eric, allowed me to take his dad's Sportavia for the purpose of getting it airborne again. 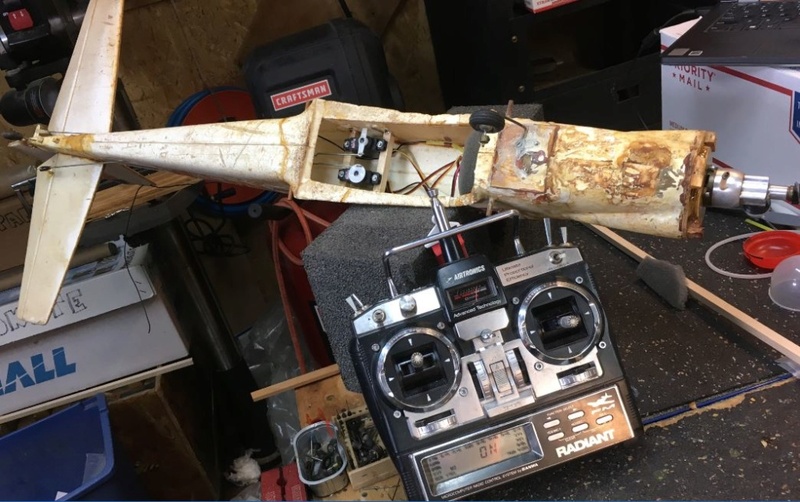 It's got all of the proud scars of a model that wasn't allowed to wear out, and each repaired crack and patch could tell a story of great afternoon flying adventures with good friends. 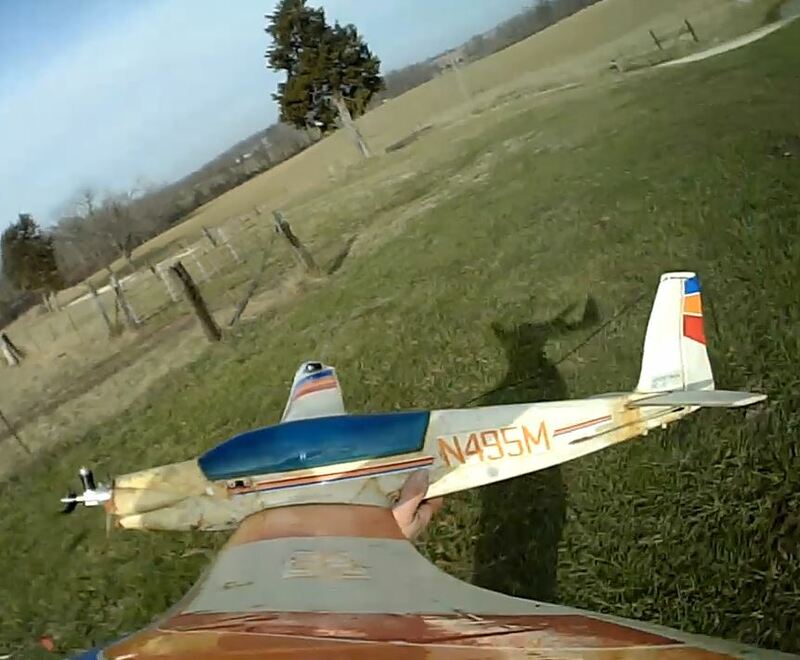 While admittedly looking fairly rough, it appears to be sound enough to fly, so I finally took a winter afternoon to show it some TLC. Since Mud Dabber is down for repairs, I put it's radio in the Sportavia, and swapped out Neal's Futaba servos for some HiTech units. 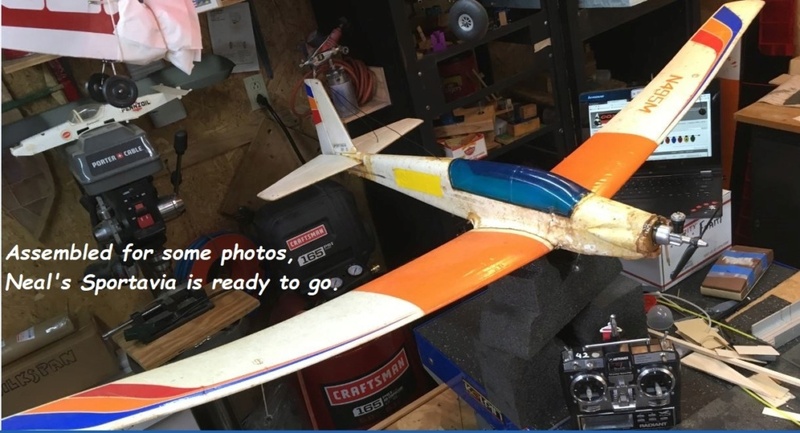 It's all checked and ready rock, but for a test-run of it's "Silver Bee" engine (basically a Bebe Bee with a bigger tank), so the next set of photos will be of it's first flight in many years. I'll probably pack it to Cairo for our New Years Day Fun-Fly on Tuesday, along with getting Eric some stick time on his dad's sailplane. I'd bet that Neal is getting a chuckle from the fuss being made over his old model airplane. You'll have to christen it Phoenix -- looks a little like it has risen from the dead. Just kidding -- great job of getting an old horse back on it's feet. andrew wrote: You'll have to christen it Phoenix -- looks a little like it has risen from the dead. Just kidding -- great job of getting an old horse back on it's feet. That's a fairly apt tag! Luckily, Neal's son if very fond of his dad's memory, and made sure this and others survived. Nice re-resurection Kim. I'm sure he's looking down smiling waiting for that day it goes up in the air again. Nice restoration to flight worthiness, Kim. I'm sure his son will have a kick out of it, watching you fly it. If you squint really hard it does look like the plane that Jimmy Stewart (aka Frank Towns) flew out of the desert in the original (and best) Flight of the Phoenix movie. It was an altered real plane that actually flew and was designed on the spot by a (fictional) model airplane designer. Airport Journals wrote: Initially, Tallman was supposed to fly the P-1 in a landing sequence in Buttercup Valley, in the Arizona desert, but he shattered his kneecap during a fall at home. On July 8, 1965, Mantz, 62, came out of semi-retirement to take his place. As the plane touched down, the wheels struck a small sandy hump of sun-baked dirt that started to drag heavily at the undercarriage. 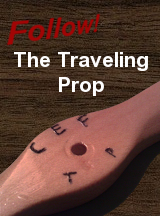 Mantz gave the engine full throttle, and the plane broke free of the sand. It traveled about a hundred yards with Mantz pulling back on the stick. However, the bump had broken the back of the aircraft, and it split in two, tumbling over at 90 mph on the desert floor, breaking up in the process. 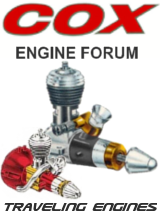 Mantz died instantly when the engine crushed him. Rose, standing behind in the rear of the makeshift cockpit, had strapped himself to a stringer. 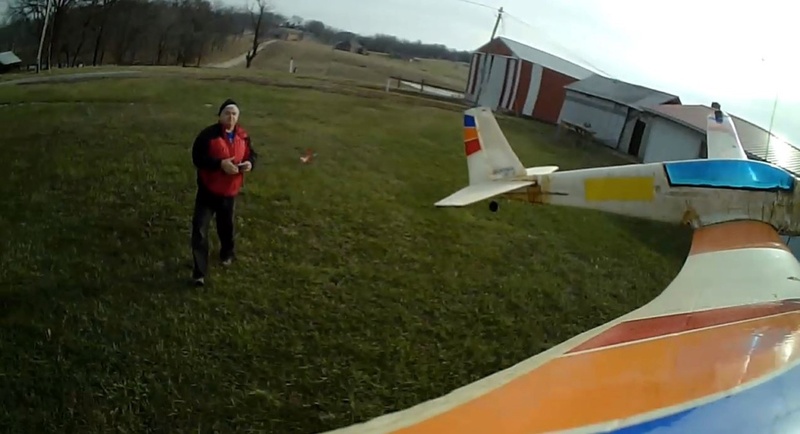 He was able to release the belt and kick free of the plane. He broke his shoulder blade, but survived and eventually flew again. 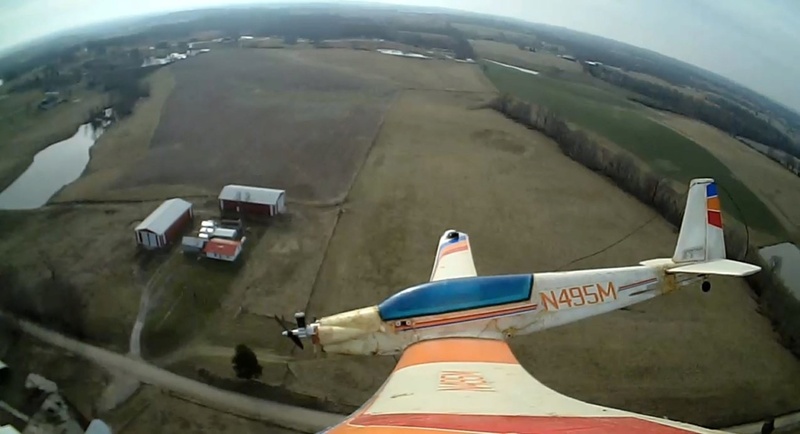 When the NTSB accident report was later released, it cited pilot error, stating “pilot-in-command misjudged altitude…airframe overload failure…and alcoholic impairment and judgment.” It’s hard to understand today, but Mantz drank when he flew—and judging by his performances, was still a good stick. Funny George, after wondering about that credit the first time I saw the film so many years ago, I just googled it too and found a shorter version as a news release. Had a very calm day today in S.E. Missouri, so Neal's Sportavia got to make some laps around the hill in the cool air. 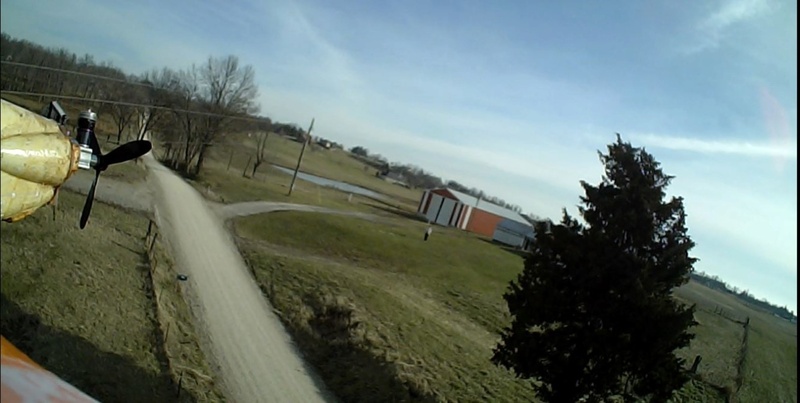 Gonna try to make a short video out of the footage I got, but for now, here are some stills. Nope, the Sportavia didn't switch props in mid-air. 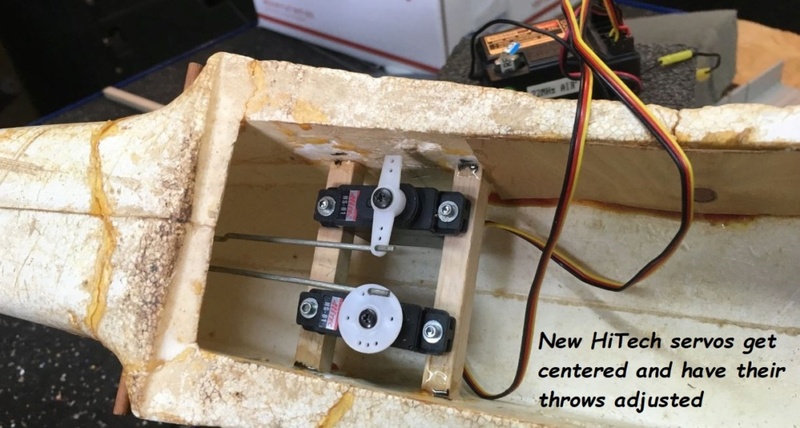 On the last couple of flights, I tried a three blade to see if it would help with harmonic waves in the video footage, but it didn't make any difference. Is that "The Tree" in the last picture. Yeah, that's the cedar tree that forms the right side of my "Landing Channel" on the approach to my front yard. Powerlines form the left side (must there ALWAYS be powerlines??!! ), and while it's hard to see it, yet ANOTHER line was recently strung below the original two, just to help quash any temptation to fly under them as an emergency exit! The Sportavia has the familiar glide we loved back in the day, and is probably a bit better since it's not packing the big clunky radio gear from the 1980's. So, yet another flashback ! Yea looks like hes about to thread the needle between the tree and power lines , O and that fence Thanks for the stills Kim looks like it did well !! That's amazing to see a plane that's been shagged so rotten fly so well. getback wrote: Yea looks like hes about to thread the needle between the tree and power lines , O and that fence Thanks for the stills Kim looks like it did well !! 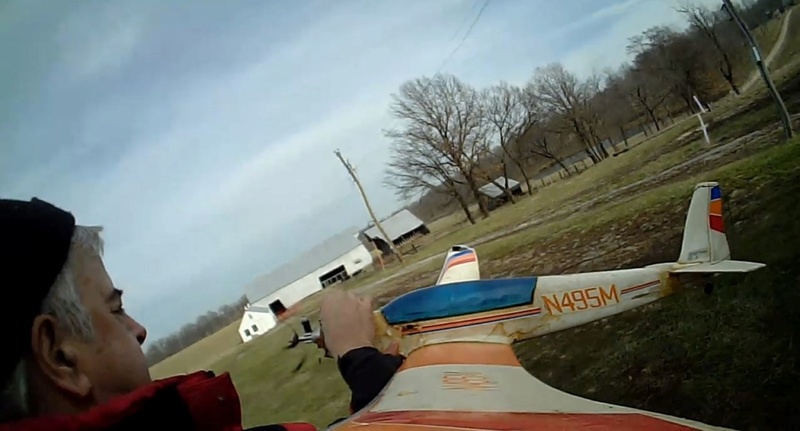 There's collection of clubs that gather at the little airport at Cairo, Illinois for a New Years Day Fun-Fly, and the Sportavia and Lazy Bee are going with me, so maybe there will be more footage. I'll at least have photos of us talking about flying and eating chili !!!! Kim, that's very cool. The Philly Fliers will be out on New Year's day. We've been doing this for quite some time. I have to thank Larry Wilks who provides us with those nutritious hot dogs and hot chocolate. Larry arrives with his Coleman stove and feeds us ravenous flyers. Now if we can only get the guys to fly without hot chocolate mustaches it would make for better pictures. We were out on Sunday doing a bit of clean up. 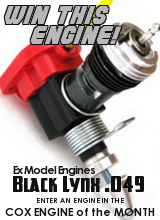 I got in some good flights but I was able to run a good bit of engines that I never ran before. I'll be looking forward to tomorrow as were going to be in the 60's, not very common for these parts. Last year it was a goose filled field with snow all over, I suppose those were the dumb ones that didn't want to fly south. The Fox .35 barking out is a effective goose removal tool. Up, up, and away! Great pictures. Glad she went up in the air again. That is a neat looking plane there. Kim, Thanks as always, for some great reporting and photos. Nice to get an old model in the air again! Happy New Year.. and best of luck for tomorrow's flights!! !